You get home from a long day at work, cook dinner and get into bed. Instead of picking up a book, you unlock your smartphone and scroll through Instagram or check our Facebook. You watch your screen intently, viewing, consuming and eventually closing your eyes. The smartphone, originating from the personal computer, is a medium that atomizes the user, dislocating them from the larger social and environmental implications of smartphone e-waste, cloud data center pollution and political conflicts over smartphone raw material extraction. Compounding that atomization and dislocation is the selective framing of smartphones through company advertising to define their products as devices of pleasure. The affect of selecting framing creates a conceptual disconnect between the smartphone as pleasure-media and the smartphone as e-waste. In the following paper, I will provide a conceptual and visual re-framing of the smartphone as e-waste. First, by arguing that “seeing” as optical is symbiotic with our linguistic and cognitive processes of attaching meaning to concepts; a precursor for attaching value to an object. Second, I will provide theoretical frameworks for media as materially consequential, shifting our view from the smartphone as pleasure-media to the smartphone as e-waste. In 1967, Marshal McLuhan made the argument that the medium of communication has greater impact on the individual than the content of that medium (1). When we look down at our smartphones on the crowded subway, the relation we form with our devices is between object and subject, and not between object and object(s). The smartphone as a singular viewing device atomizes and dislocates the individual from the complex interrelations between objects and their material histories, or namely the smartphone and e-waste. The original production of the smartphone was, and is, designed for personal use. The smartphone has one screen, a form factor suited for single handheld use, and software that individually allows curation of our digital selves through social media, personal financing and media consumption. For McLuhan, content is dictated by form (3). Here, we can note the individual curation of the self through software such as social media, facilitates that the user consumes and creates content that is individualistic in nature. To note, the internet as a medium facilitates pluralistic interrelation between objects and their complex objective material histories, but for McLuhan and myself, medium overpowers content. Furthermore, we may have the ability to conceptually connect our smartphones to e-waste by searching via the internet, but a recent study found that searches on Google for “iPhone” resulted in 1.58 billion views, while “e-waste” produced 83.3 million and “electronic waste” produced 14.1 million (Good 598), a vast disconnect between the object and its materiality. E-waste is about the complex interrelationships between our smartphone devices and the mining of cobalt by children in the Democratic Republic of Congo for iPhone batteries, disproportional smartphone e-waste landfills in developing countries such as China and India and cloud data centers that produce larger amounts of Green House Gases which contribute to climate change (Greenpeace). If we are to re-frame our understanding of the inter-meshed complex geo-political frames that connect our smartphones to e-waste, we must first step back and understand how “seeing” our devices are based on a visual, linguistic and conceptual framing of the smartphone through advertising and the lack of visual representations connecting smartphones and e-waste. 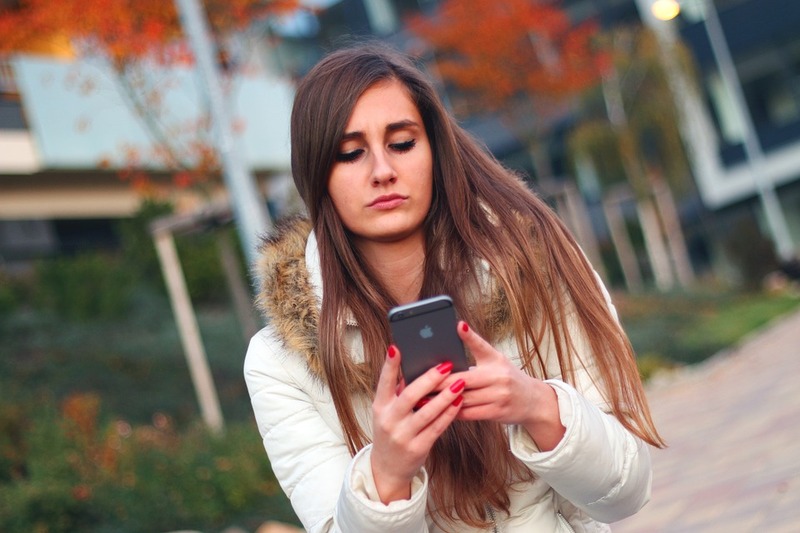 When we look at our smartphones resting in the palm of our hands, our conceptual understanding of the object is influenced by the language and concepts from which we have been exposed. Jennifer Ellen Good in Creating iPhone Dreams: Annihilating E-Waste Nightmares, argues the conceptual disconnect between the iPhone and e-waste is a result of “hypocognition” and “symbolic annihilation” (592). Symbolic annihilation “proposes our understanding of the world is affected not only by…what the media do show us…but also what the media do not show us” (592). Ellen Good notes, Apple’s advertising from 2007 to 2018 shows that the iPhone is consistently framed as a “known object” (595) that is “magical and revolutionary” (Heilpern). Here, the iPhone is visually, linguistically and conceptually constructed as a material object with no connection to its material objectivity; rather the iPhone’s materiality is connected to non-material abstract concepts applied to the viewer, consumer, or user. This creates a disconnect that George Lakoff calls “hypocognition”, a cognitive gap between “words” and “concepts” (600). The gap between “words”, (iPhone) and “concepts” (e-waste) only allows the individual to look at their smartphone and understand them narrowly as objects of pleasure. John Berger, an English art critique, wrote “the way we see things is affected by what we know or what we believe” (8). Berger’s language “see things” establishes a connection between optical “seeing” and cognitive “seeing”, or more directly “the way we see things” is the way we understand them. For Berger, his “what we know” and “what we believe” directly connects to George Lakoff’s hypocognition and Good’s symbolic annihilation. Here we can note Ellen Good’s use of the visual lingua of “showing”. Apple’s visual representations of the iPhone create hypocognition by selectively showing iPhone materiality as connected to non-material concepts, but visual representation can also create hypercognition, the connection between words and concepts to attach meaning to concept, object or subject. Thus, there is a symbiotic interrelationship between “what we see” as forming our understanding of the world, and our understanding of the world influencing “what we see”. In Greenpeace’s report Exporting Harm: The High-Tech Trashing of Asia, they note “rather than having to face the E-waste problem” we look away (1). Consistent with Good’s and Berger’s “seeing” and “showing”, the language of vision is established as a form of creating understanding and meaning. Here, “having to face” is a colloquial term meaning to take ownership, become aware and/or accept a truth, which is mobilizes through the language of body, and specifically vision. The language of the body and vision is thus inscribed as a way of knowing, a way of understanding and a way of accepting truth. For the individual to look at their phone and see e-waste, we must shift our gaze, because “to look is an act of choice” (Berger). Fg.2. 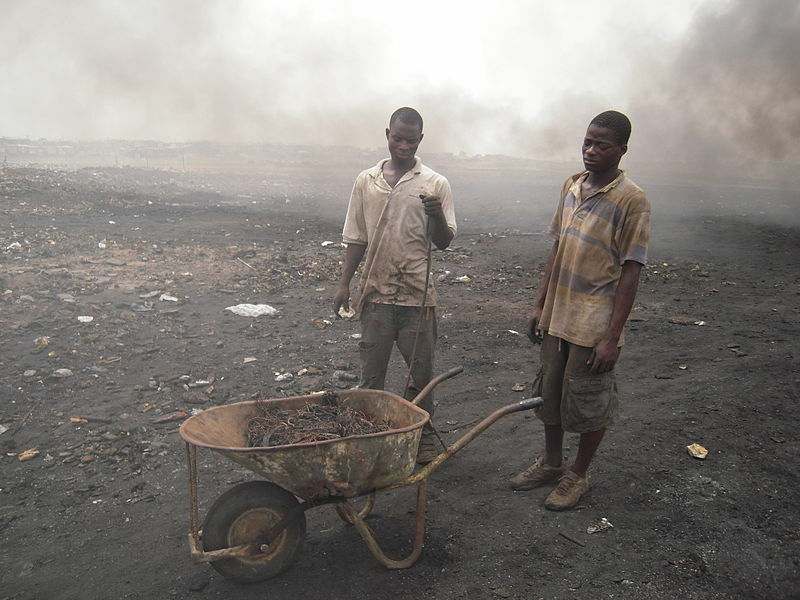 Workers following burning of plastic off wires for copper recovery [in Ghana]. Jcaravanos, Wikimedia Commons, Creative Commons Attribution Share-Alike 4.0 International. https://commons.wikimedia.org/wiki/File:E-waste_workers.jpg. 26 March 2010. Digital. Electronic waste is the fastest growing global waste management problem (Exporting 1). In the United States, 416,000 mobile phones are discarded everyday (Good 590). Globally, 40 million tonnes of e-waste are created every year (Good, 590, UNEP), with most of that waste disproportionately impacting the lives of people in developing countries such as China and India (Exporting 1). In India alone over 1 million people work manually recycling e-waste in massive landfills (Pinto). Shifting our gaze to smartphones as e-waste, Jussi Parikka’s “mediacultures” provides a helpful guiding framework. She introduces Donna Haraway’s concept of “naturecultures” – where nature and culture are “material[ly] entwin[ed]” through “various…meanings and interactions” (2). Haraway’s framework is adapted by Parikka, who uses “mediacultures” because they acknowledge the complex layering and intertwining of media devices and nature (2). She notes “media are of nature, and return to nature –where the production process for our media devices, from screens to circuits, networks to interfaces, involves the standardization and mass-mobilization of minerals and other materialities (3). Parikka’s “mass-mobilizations of minerals” both nods to the vast geological scale of materiality that smartphones originate and exist within, while also noting the immense temporality of smartphone e-waste. While Parikka’s argument for the entwining and immensely complex interrelations between objects and object materialities, we can easily see why its not only Apple’s narrow visual framing through advertising or hypocognition cause by disconnected search engine results that create a gap between smartphone and e-waste but also the immense difficulty of looking at your palm size phone on the subway and connecting it to the “messy, topological …entangle[ment] of so many layers from nature to society…to psyche” (19-20). Parikka is not the only scholar to show media as material. Fuller notes that media are not only about “energies” and “technological…forces” but they are also “aesthetic” (9). Here, Fuller argues that media are both objectively material and highly visual, or namely that their materiality co-exists with their aesthetic quality. We can see and understand them as material which allows us to place them inside the “media ecology” of “energies” and “forces” (9). Seeing and vision, again, is a form of deepening our understanding of the smartphone as materially consequential. Much like Parikka, there is complex layering and vast interrelations between media and their materiality. Simondon also argues that “objects…show how they have been formed through evolutionary layering…this applies…also to mechanical machines” (9). Here, Simondon uses Berger’s and Good’s visual lingua to “show” or “see” as a way of understanding “how” an object exists. Gabrys, a media scholar, also notes that “electronics often appear only as ‘media’…apparently lacking in material substance” (2). Here, Gabrys’s argument is much closer to Good’s argument in specificity than Parikka’s, Fuller’s or Simondon’s; where Gabrys argument highlights the disconnect and “lack” of materiality to media electronics that Good’s argument mobilizes. But Gabrys goes one step further, positing that the disconnect could be in part “because they are so seemingly immaterial” (2). An immateriality that connects Parikka’s immensely complex interrelations between objects and object materiality and what Tim Morton calls “hyperobjects”. From scrolling through your smartphone photo gallery at home, to cognitively grasping the ecological, geographic and temporal scale of e-waste’s impact, the difficulty of conceptually connecting our smartphones to e-waste is what Timothy Morton calls “hyperobjects”. Morton says “Hyperobjects” occupy a vastly greater temporality and geological scale than humans are able to cognitively understand (1). His argument uses the language of “invisibility”, “time” and “scale” (1). Morton gives the example of climate change, stating humans cannot full grasp how physical objects create climate change, a phenomenon we cannot see or conceptually understand in regard to space and time. Where is climate change? What will the earth look like in 500 years due to climate change? Interestingly, Morton uses the language of vision to explicate his point. The fact they are “invisible” means that “visibility” facilitates our ability to understand how we can relate to objects and how objects relate to other objects. He notes “they exhibit their effects interobjectively; that is, they can be detected in a space that consists of interrelationships between aesthetic properties of objects” (1). Again, Morton echoes Berger, Good, Parikka, Fuller and Simondon through the language of vision as a form of attaching meaning to concepts and objects. But implicit in Morton’s hyperobjects is an inherent pessimism, noting they “can be detected” but ultimately claiming hyperobjects have “ushered in a new human phase of hypocrisy, weakness, and lameness” (2). On one rational appeal, I agree that Morton’s hyperobjects are applicable terminology for smartphone e-waste. Considering the geo-political nature of e-waste, “mass mobilization” (Parikka 3) of media materials, and the “messy, topological…entangle[ment] of so many layers” (Parikka 19-20), Morton’s hyperobjects seem to define smartphone e-waste accurately. How we can measure the temporality of 416,000 smartphones being discarded everyday in the United States, or 40 million tones of e-waste produced each year globally? How are we supposed to connect our Facebook messages to a 2% increase in Green House Gases from cloud data centers? (Clean Cloud 9) What do those numbers mean, not only as words on a page, but as a visual representation of reality (Fg.2)? But, Morton’s hyperobjects fail to completely and accurately define smartphone e-waste because he implicitly believes that humans are unable to cognitively and visually contextualize the scale of hyperobjects, or e-waste. Climate change may be a hyperobject, but smartphone e-waste has yet to become “invisible” to our minds eye. In Pinto’s work, E-waste Hazards: The Impending Challenge, he writes “building of consumer awareness through public awareness campaigns is a crucial point…regarding the existence and dangers of e-waste”. As Berger argued earlier “the way we see things is affected by what we know or what we believe” (8) and Good’s symbolic annihilation and hypocognition stated that visual and linguistic representation all form the basis from which we can connect “words” to “concepts”. Ultimately, “seeing” is both an optical and cognitive function that symbiotically interacts create meaning for the world around us. It is only through re-framing, a visual re-presenting, and selective re-focusing that will now allow us to look down while commuting to work and see the vast geopolitical and environmentally interconnected materiality of that tiny little device we call: smartphone. Gabrys, Jennifer. “Digital Rubbish: A Natural History of Electronics.” Digitalculturebooks, 2011. quod.lib.umich.edu, doi:10.3998/dcbooks.9380304.0001.001. Good, Jennifer Ellen. “Creating IPhone Dreams: Annihilating E-Waste Nightmares.” Canadian Journal of Communication; Toronto, vol. 41, no. 4, 2016, pp. 589–610. Greenpeace. “Exporting Harm: The High-Tech Trashing of Asia.” Greenpeace East Asia, http://www. greenpeace.org/eastasia/publications/reports/toxics/2006/exporting-harm-the-high-tech/. Accessed 1 Apr. 2018. Heilpern, Will. “The Best Ad Apple Produced from Each Year since Its Watershed 1984 Super Bowl Hit.” Business Insider, http://www.businessinsider.com/apple-history-through-advertising-40-years-anniversary-2016-3. Accessed 1 Apr. 2018. /publication/6986/how-clean-is-your-cloud. Accessed 3 Apr. 2018. John Berger, Ways of Seeing. Viking Press, 1973. Morton, Timothy. Hyperobjects: Philosophy and Ecology after the End of the World. University of Minnesota Press, 2013. ProQuest Ebook Central, http://ebookcentral.proquest.com/lib/ryerson/detail.action? Parikka, Jussi. “FCJ-116 Media Ecologies and Imaginary Media: Transversal Expansions, Contractions, and Foldings | Fibreculture Journal: 17, 2011. http://seventeen.fibreculturejournal.org/fcj-116-media-ecologies-and-imaginary-media-transversal-expansions-contractions-and-foldings/. Accessed 1 Apr. 2018. Parikka, Jussi. “Introduction: The Materiality of Media and Waste”. Medianatures: The Materiality of Information Technology and Electronic Waste. Kenneth Allen, CC-BY-SA-2.0, Wikimedia Commons. http://www.livingbooksaboutlife.org/books/Medianatures#A_.27Frozen.27_PDF_Version_of_this_Living_Book. Accessed 1 Apr. 2018. Pinto, Violet N. “E-Waste Hazard: The Impending Challenge.” Indian Journal of Occupational and Environmental Medicine, vol. 12, no. 2, Aug. 2008, pp. 65–70. PubMed Central, doi:10.4103/0019-5278.43263. the purposes of research, private study, or education.